Penn State is planning on a key return this weekend as defensive end Shane Simmons is slated to play, according to James Franklin. The sophomore made nine appearances as a freshman and a consistent force on the Nittany Lions’ defensive front. He finished the 2017-18 season with 15 total tackles, 4.5 of which came for a loss. The loss of Torrence Brown due to a season-ending injury had slotted Simmons into a larger role, expected to take the starting job full-time prior to his own injury. In addition wideout KJ Hamler is expected to play this weekend, Franklin confirmed. Hamler left the Ohio State game in the fourth quarter following a high hit and did not return as the Nittany Lions eventually fell to the Buckeyes for the second straight season. 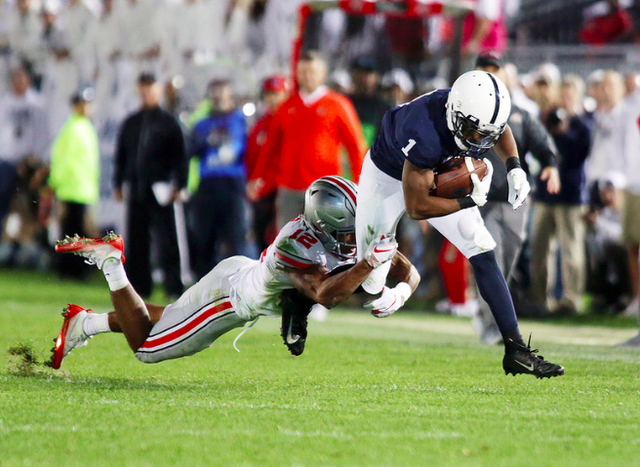 Hamler has been Penn State's most explosive player this season with 13 receptions for 308 yards and four touchdowns including a 93-yard reception against Ohio State. He has recorded a touchdown in four of Penn State's five games so far this year. Penn State basketball's relatively quiet offseason on the recruiting trail picked up a major boost as 2019 Roman Catholic power forward and four-star prospect Seth Lundy verbally committed to the Nittany Lions on Friday.